娄诤, 赵肖涯, 杜丽君, 王大维. 迷迭香酸抑制人多发性骨髓瘤ARH-77细胞增殖的作用机制[J]. 中国药理学通报, 2018, 34(8): 1078-1082. LOU Zheng, ZHAO Xiao-ya, DU Li-jun, WANG Da-wei. Mechanism of rosmarinic acid inhibiting proliferation of human multiple myeloma ARH-77 cells[J]. Chinese Pharmacological Bulletin, 2018, 34(8): 1078-1082. Abstract: Aim To study the inhibitory effect of rosmarinic acid (RosA) on ARH-77 cells and its mechanism. 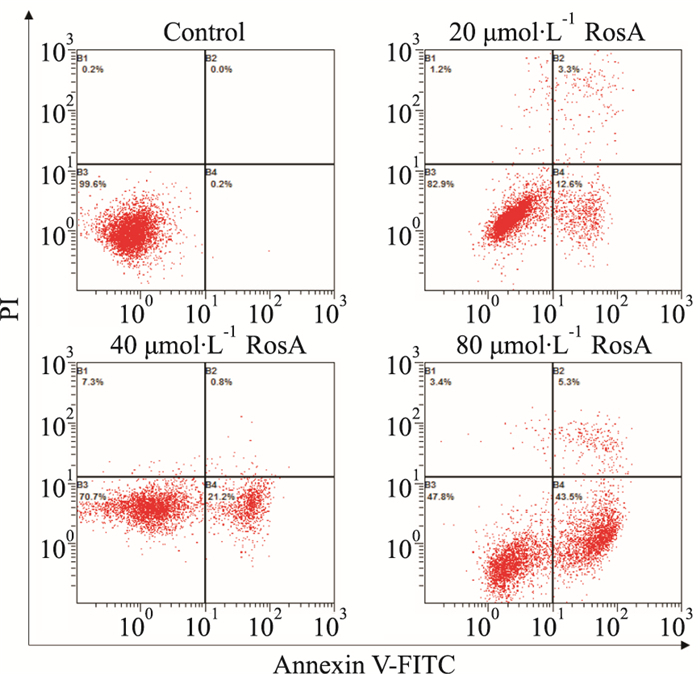 Methods The effect of RosA on the proliferation of ARH-77 cells was detected by CCK-8 method. The results confirmed that the concentration of the drug in the experimental group was 20, 40 and 80 μmol·L-1, respectively, for 48 h; the apoptosis rate was detected by flow cytometry; mRNA expression of Fas, caspase-8, and caspase-9 was measured by qPCR; the activity of caspase-8 was measured by spectrophotometry; tBid, Fas, active caspase-3, and active caspase-9 were detected by Western blot. Results RosA obviously inhibited the proliferation of ARH-77 cells. Compared with control group, early apoptosis was observed in all experimental groups(P < 0.01). 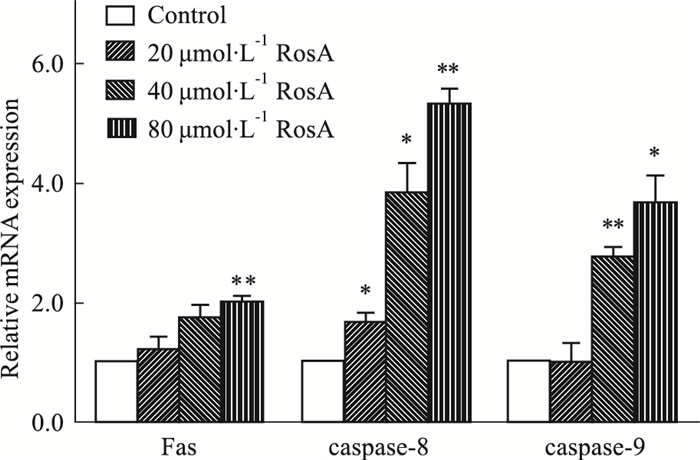 In each experimental group, the levels of active caspase-3 and caspase-9 markedly increased (P < 0.01), caspase-8 mRNA expression was also significantly up-regulated, but its protein activity only evidently increased at 80 μmol·L-1 (P < 0.01); at 40 and 80 μmol·L-1 groups, the mRNA expression of caspase-9 was significantly up-regulated (P < 0.05, P < 0.01), and the protein expression of tBid also notably increased (P < 0.01); the mRNA and protein expression of Fas dramatically increased only at 80 μmol·L-1 group (P < 0.01). Conclusions The early apoptosis of ARH-77 cells induced by RosA leads to the inhibition of proliferation. The death receptor and mitochondrial pathways may participate in the apoptosis of ARH-77 cells induced by RosA. Slobodníková L, Fialová S, Hupková H, et al. 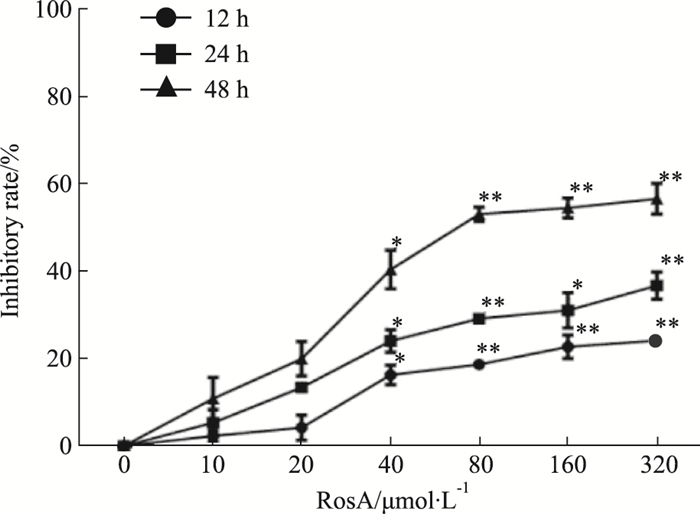 Rosmarinic acid interaction with planktonic and biofilm Staphylococcus aureus[J]. Nat Prod Commun, 2013, 8(12): 1747-50. 颜涛, 严奉祥, 周家茂, 等. 迷迭香酸对谷氨酸诱导的PC12细胞损伤的效应[J]. 中国药理学通报, 2006, 22(8): 955-9. Yan T, Yan F X, Zhou J M, et al. 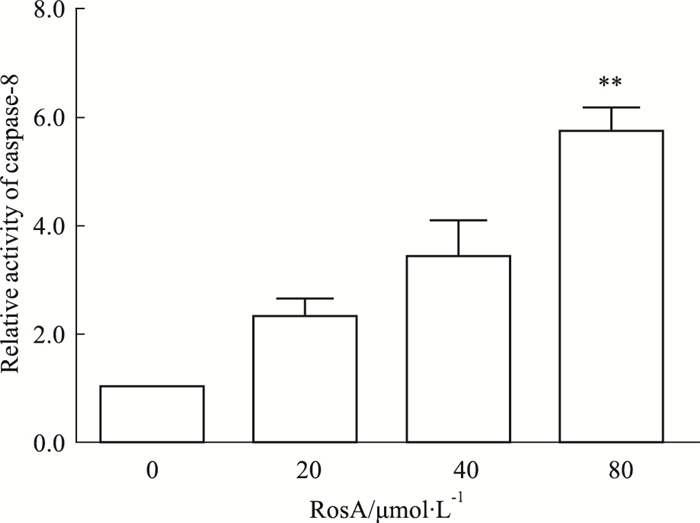 Effects of rosmarinic acid against PC12 cells injures by glutamate[J]. Chin Pharmacol Bull, 2006, 22(8): 955-9. 韦立群, 李清, 甘嘉亮, 等. 迷迭香酸衍生物RAD-9通过PI3K/Akt和p38 MAPK信号通路诱导胃癌MGC-803细胞凋亡[J]. 中国药理学通报, 2018, 34(2): 256-60. Wei L Q, Li Q, Gan J L, et al. Rosemary acid derivative RAD-9 induces apoptosis in gastric cancer MGC-803 cells via PI3K/Akt and p38 MAPK signaling pathway[J]. Chin Pharmacol Bull, 2018, 34(2): 256-60. Schleich K, Buchbinder J H, Pietkiewicz S, et al. Molecular architecture of the DED chains at the DISC:regulation of procaspase-8 activation by short DED proteins c-FLIP and procaspase-8 prodomain[J]. Cell Death Differ, 2015, 23(4): 681-94. Glab J A, Mbogo G W, Puthalakath H. BH3-only proteins in health and disease[J]. Int Rev Cell Mol Biol, 2016, 328: 163-96. Chinese Pharmacological Bulletin, 2018, 34(8): 1078-1082.